Staples freshman Max Zimmerman returns a shot during match on Monday at Greenwich High School. Zimmerman's win over Axel Hebrand (6-7, 6-2, 6-4) clinched the Wreckers' undefeated regular season. 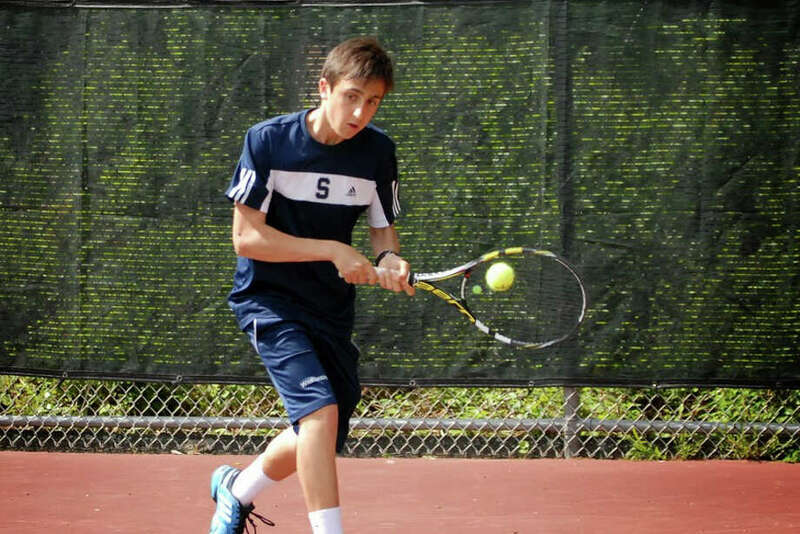 It was fitting that the final hurdle in the Staples boys tennis teams' quest for a perfect regular season came in the form of the team that had handed it so many crucial defeats over the past several seasons. Greenwich, winners of 11 of the previous 12 FCIAC championships, pushed the Wreckers to the limit Monday. Staples took down the Cardinals 4-3 in a contest that included four three-set matches to complete an undefeated regular season at 18-0. "We've had some battle-tested matches against some good teams, especially out-of-conference," Staples coach Kris Hrisovulos said. "I think that helped us prevail, but also experience with our seniors. We've been through the ropes and just fought through." The win over Greenwich was the Wreckers' first since 2011. The Cardinals defeated Staples for their last three FCIAC titles. "It seems like every year we know exactly when we are playing Greenwich," Staples senior Jack Reardon said. "It always the same thing; same preparation and same teamwork. We haven't won everything yet; we still have to focus on FCIACs and states." Staples senior No. 2 Luke Foreman overcame a 5-4 deficit in the second set to fend off Greenwich's Chris Salisbury 6-2, 7-5. The win gave Staples a 3-2 lead and freshman Max Zimmerman clinched the victory in a hard-fought three-set win over Cardinals' Axel Hebrand. "(Zimmerman is) the kind of kid that stays in the moment," Hrisovious said. "He doesn't get caught up in that. He eats, sleeps, drinks tennis. He loves the training and he loves this moment. It was great to see him stay even keel and push and come up with a big win as a freshman." The Wreckers also accomplished the impressive feat of not dropping a match in doubles all season. Monday, the teams of Reardon and Will Andrews and Baxter Stein and Jason Chaskin ensured that streak would remain intact with wins over Shaw Speer and Louis McKenzie (7-6, 6-4) and Tyler Dagnino and Max Minichetti (1-6, 6-1, 6-3) respectively. "(We had some) big points," Andrews said. "There were some games that we didn't play well, but we stepped up when it mattered and made some big shots." With the match already decided, Cardinals junior Marcos Eslava edged Staples' Connor Mitnick 6-3, 5-7, 6-4. Eslava trailed 4-3 in the third set before winning three straight points. "I knew (the match was over) when I was down 3-4," Eslava said. "There were a couple points where it was very clear (Mitnick) should have won, but for some reason I was able to run down the balls and win those two points." Cardinals No. 1 Ari Cepelewicz took down Zack Levin 6-3, 6-3, and No. 3 Dickerman Hollister defeated Staples' Josh Moskovitz 4-6, 6-2, 6-2. "We all played very well," Eslava said. "We all tried to play our best, but we played well in general." Each team took two of the three-set affairs, leaving Greenwich (14-2, 14-2) with plenty of confidence it can return the favor should the teams meet in the FCIAC final May 29. "It gives us perspective on what we need to work on," Greenwich coach Richard Lane said. "I actually appreciate that they showed us a few things that we need to tweak at FCIACs and states." Staples 4, Greenwich 3 (at Greenwich High School); Singles: Ari Cepelewicz (G) def. Zack Levin 6-3, 6-3; Luke Foreman (S) def. Chris Salisbury 6-2, 7-5; Dickerman Hollister (G) def. Josh Moskovitz 4-6, 6-2, 6-2; Marcos Eslava (G) def. Connor Mitnick 6-3, 5-7, 6-4; Max Zimmerman (S) def. Axel Hebrand 6-7, 6-2, 6-4. Doubles: Jack Reardon/Will Andrews (S) def. Shaw Speer/Louis McKenzie 7-6 (5), 6-4; Baxter Stein/Jason Chaskin (S) def. Tyler Dagnino/Max Minichetti 1-6, 6-1, 6-3. Records: Staples 18-0, 16-0 FCIAC; Greenwich 14-2, 14-2.